So as summer is drawing to a close, I thought I’d go with that classic warm weather style: nautical. Not only nautical, but I’ve gone for a vintage nautical look. 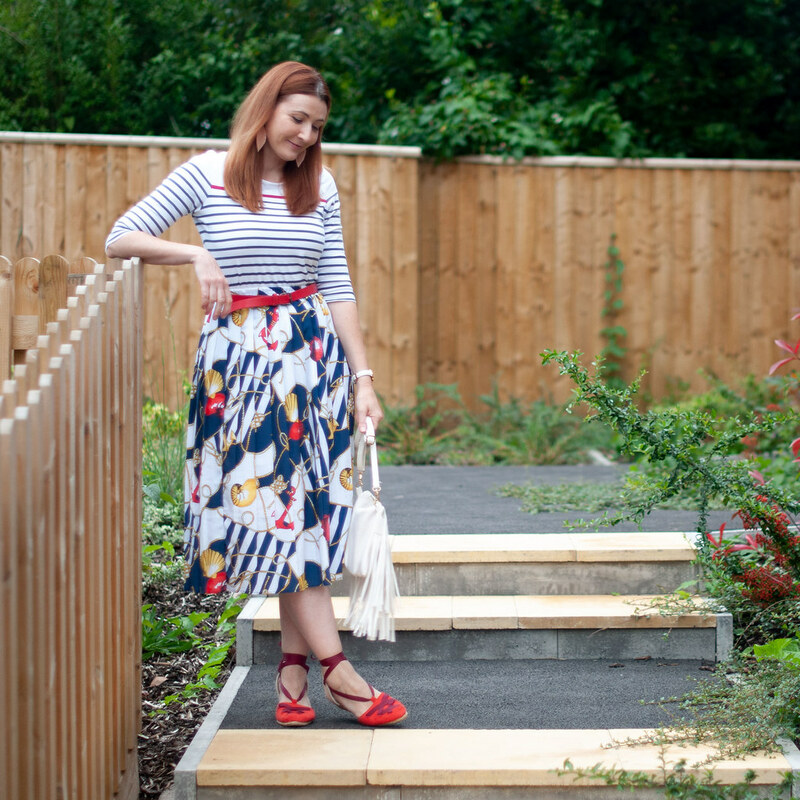 This skirt is so old (I know it’s vintage, but I bought it years and years ago) and it’s appeared so many times on the blog that I’m thinking it’ll never go out of fashion. But then, does any vintage piece actually go out of fashion? Some looks may be more popular than others at any one time, but unlike new pieces they can’t date because they’re already dated (in a good way of course) – do you do know what I mean? Make sure it’s so old-fashioned that it’ll never go out of fashion… now THERE’S an oxymoron if ever there was one! Though to be absolutely honest, this outfit came about for practical reasons. It started with the skirt, which has an elasticated waist. 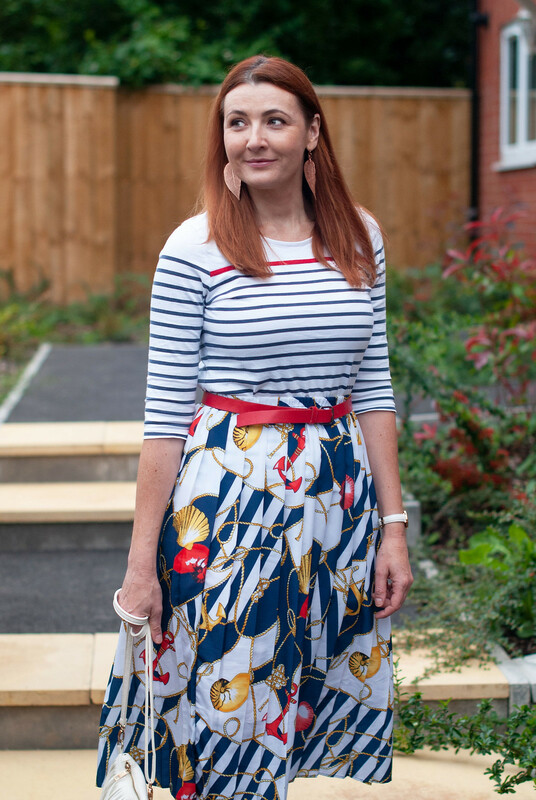 Considering the occasion I wore it to was a birthday party/barbecue (over the bank holiday weekend), elasticated waists are pretty much the unspoken official dress code. Plus a Breton t-shirt is just about the only thing you can possibly consider if you’re doing the nautical thing, amirite? 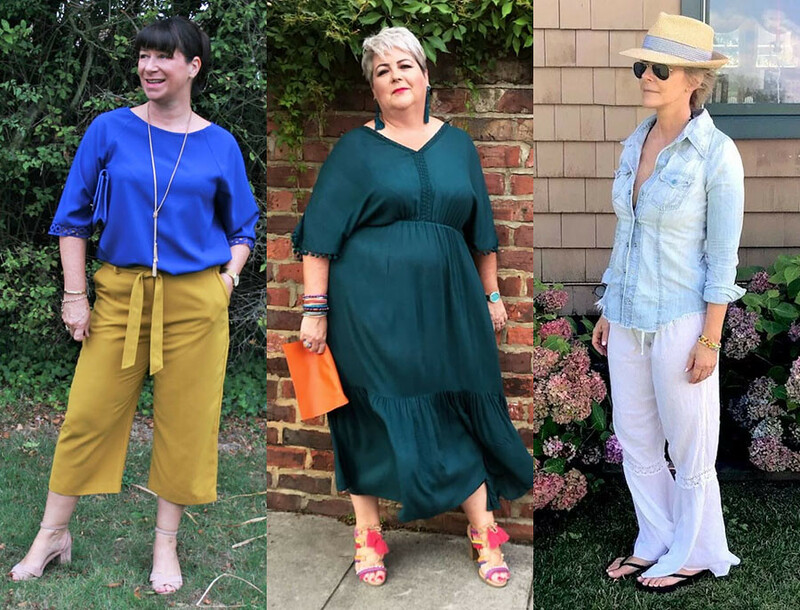 Although most of the outfits I wear every day don’t appear on the blog (seriously, you do NOT want to see my neverending repeats of sweatpants and sweatshirt, dungarees and t-shirt, slouchy maxi dress and cardigan, etc. etc. ), I AM running out of options for something different to wear on a daily basis. After moving house last month we’re still without wardrobes (long story short: can’t buy and put up wardrobes till the designated bedroom is clear of boxes, can’t clear the boxes till the loft is boarded), so all my autumn/winter clothes, shoes, boots and jackets are packed away in boxes still. Therefore the summer needs to just hold out a bit longer till I can finally unpack my warmer clothes. Until then I have to make do with the few pairs of shoes and sandals I have (hence these red espadrilles appearing so much on the blog!) as well as whatever I have in the way of dresses, skirts and tees. I’m just getting a bit tired of looking at the same few things on our temporary clothes rail… living out of boxes is challenging, to say the least! A few of you commented (very kindly!) on my post where I mentioned gaining so much weight recently, and it seems it resonated with quite a few of you. Middle age spread is real, ladies! While there are a lot of factors that have contributed to my weight gain (most of them self-inflicted, to be fair), my health (and future health) is a big concern to me. I can’t go on much longer with how generally lethargic, tired and headachey I feel most of the time, plus my skin and joie de vivre are suffering. Something REALLY has to be done if I don’t want to end up having a health crisis in the very near future. Now, it’s as if the blogging gods heard my cries, because next month I will be going on a six-day vegan detox retreat that was very kindly offered to me… I cannot WAIT. DO YOU FIND THAT YOUR VINTAGE PIECES NEVER SEEM TO GO OUT OF “FASHION”? TELL ME IN THE COMMENTS…! Disclosure: This post contains some affiliate links which means if you click through and buy I may receive a small commission at no cost to you (click here for my full disclosure). Items listed as c/o were gifted. The link up goes live every Monday at around 3pm UK time and will stay open for a week. Whilst the original article was of course aimed at the 30+, you can be ANY age to link up. The only criteria is that you’re wearing whatever you damn well like! Want to receive an email reminder for the next link up? Please note that due to the new GDPR laws I’m unable to send an email reminder unless you subscribe to the mailing list of your own accord. CLICK HERE if you wish to be sent an email with a reminder to link up to the #iwillwearwhatilike link up as soon as it’s live! P.S. CHECK OUT MY PINTEREST BOARD WITH THE BEST OF THE #IWILLWEARWHATILIKE LINK UPS – HAVE YOU BEEN PINNED…? I love this nautical look. The strips and the print on the skirt look so good together. Love a good fashion linkup, so many good ideas and inspiritation! 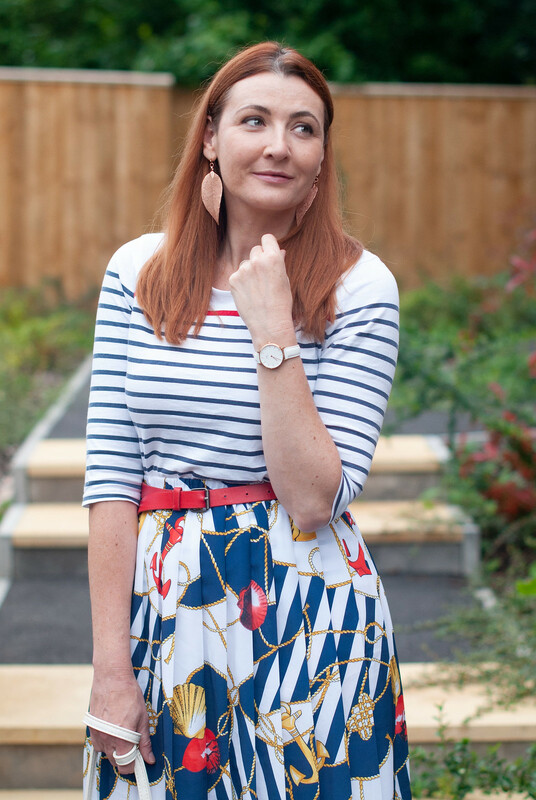 You definitely can’t go wrong with a nautical look, Catherine. And living out of boxes, I guess you could consider it a styling challenge, just too bad there’s no choice! Ack! It’s been a busy time for me too. Lots of excitement. Thanks for hosting the link-up. Hi, I totally love the way you’ve mixed up the patterns. Until recently I thought it just wasn’t the right thing to do however, after seeing your blog I will def be mixing stripes with other patterns. Your style is refreshing and I love it. Loving your blog, which I only just discovered as I am about to hit my last year of my forties! Vintage? Well, I ain’t wearing 80s shoulder pads a la Joan Collins in Dynasty. No matter how vintage they are. But years ago I rescued a lovely designer canvas and leather waisted jacket with belt that is still in my closet. It must be from the 60s, if not 50s. Last worn around ten years ago but I can’t bear to part with it. it still looks so sharp. I just widened a bit since then, so it doesnt fit as flattering as it once did! You’re so right! As usual Catherine you’ve said exactly what I’ve been thinking lately. Take the latest leopard print trend, we’ve all been there done that. Inevitably anyone over 35 will have a piece of fabulous leopard or animal print already in their wardrobe. Some of it is bound to be vintage by now, which makes it even cooler in my opinion. The way we style it will probably different this time around but that’s the fun part right? 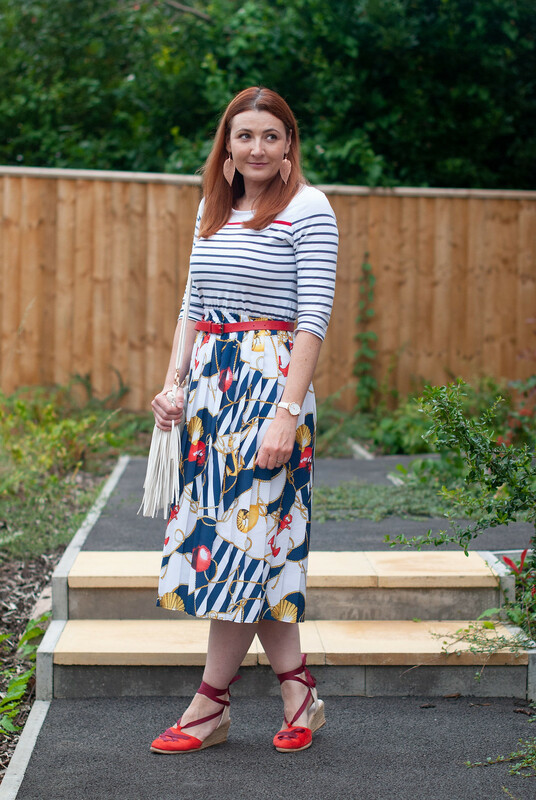 Regarding your vintage nautical look, I love it! Lovely pattern mixing! The vegan detox retreat sounds fantastic1 I’ve been vegan for 10 months now and will never go back to eating animal products, I feel loads better for it. My husband is a big meat eater but after a recent flare up of arthritis/gout he’s had to change his diet and cut right back on booze…and after only a couple of weeks he’s lost weight! I bet you can’t wait to be totally unpacked and be able to relax in your new home! But a detox retreat sounds like a much needed rest for you, Catherine! Can’t wait to read all about it. 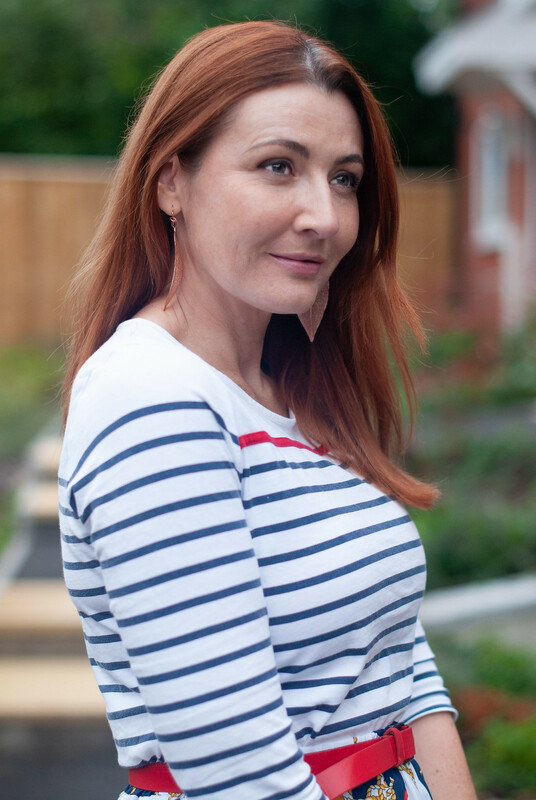 Love the outfit – I can never resist a breton top and I do love those red espadrilles, they go with so much! A very nice outfit with a great pattern mix and perfect colors! I look forward to reading about the detox week! I hear you re middle-age spread, it is all over me like butter I seem to be stuck at a new weight that is a good dress size or two larger – I don’t own scales as it would only get me down! But feeling lethargic etc is not good, so I really hope you get some vibrancy back after the detox. Nonetheless you still manage to look radiant. What a cute look! Absolutely adore the pattern mixing. Oh gosh Catherine, thank you for the feature!!! Love your mix! Stripes make any look. I love the way the red colour pops throughout your whole outfit. I find myself scouring ebay for vintage clothes more and more lately, but particularly at the moment as I’m rewatching episodes of Poirot and the dresses are inspiring me! Thanks Helen – the boxes are somewhat driving me mad… I’m counting down the days till we get our storage sorted though! It’s my absolute pleasure, Jacqui! To be honest I didn’t even notice I’d mixed patterns, they just ‘went together’!! We moved into our house 11 years ago in July, I had 2 suitcases of summer clothes and shoes, everything else was boxed up. We did have a small old wardrobe put up in the cellar where we put the coats. We got wardrobes in the bedroom about 18 months later! So I had several suitcase change overs. 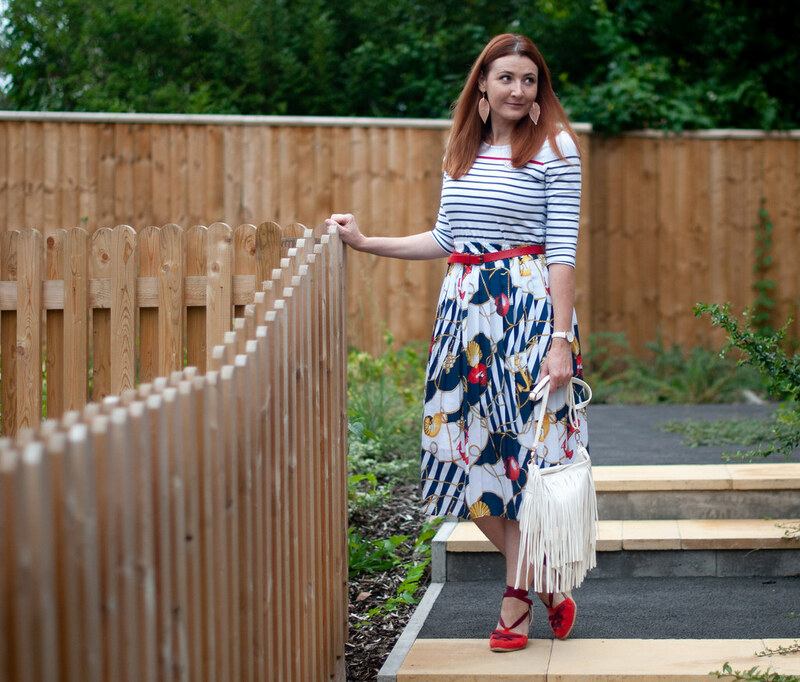 I didn’t have concept of a capsule wardrobe back then and not expecting things to take as long as they did, I didn’t plan as well as I could have. I didn’t have an epiphany, no moment where I realised that a minimal wardrobe was going to be the way forward! My advice, get those wardrobes up asap, as it’s no fun living out of suitcases! To be honest I’m lucky, one of the things at the top of my husband’s wishlist was a walk in wardrobe (either that, or he knew how to keep me happy), so In the end I might (if pushed) admit to it being worth the wait! A detox! I’m looking forward to that review! Lovely look, very elegant skirt. Thanks Nancy – and yes, a detox retreat will be an interesting read I hope! But we know you by now, and that you will persevere and make a great story out of it!! such a cute take on pattern mixing Catherine!